Open to public. Admission Free. No registration is required. Scientific and local knowledge making are constantly at play in our world, and ethnographers engage with them in ways that are contingent to the modes of the encounter. This relatively novel ethnographic condition has been fertile ground for the ongoing dissatisfaction with the positivist division between theory and practice and led many researchers to detailed study of scientific work. What are the conceptual challenges that need to be addressed if the relationship between science and local knowledges is taken up laterally? How does the interplay of ethnographic and technocultural practices affect different pathways of situating ourselves (and others) between nature and culture? These are some of the questions that we hope to address. 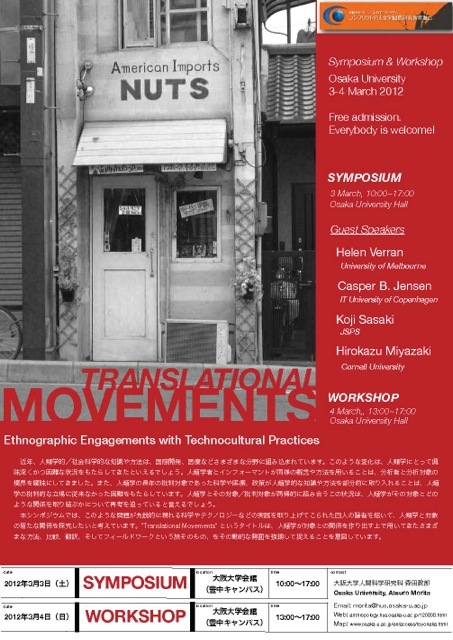 The symposium will bring together scholars from anthropology and science and technology studies to account for the methodological richness of this new mode of ethnographic engagement. 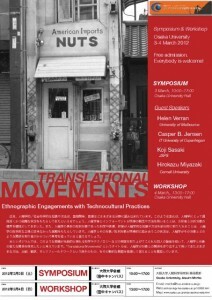 Following the international symposium of the same title, a workshop for young scholars will be held at the Osaka University Hall on March 4, 2012. The purpose of this event is to give an opportunity for graduate students and postgraduate researchers of anthropology and related fields to present their materials in English in a friendly and informal atmosphere and to receive comments from our invited guests. This entry was posted in EVENTS, SYMPOSIUMS. Bookmark the permalink.